Vietnam with its capital Hanoi is located in Asia (Southeastern Asia, bordering the Gulf of Thailand). It covers some 331,211 square kilometers (about three times the size of Tennessee) with 96,160,200 citizens. Vietnamese, English, French, Chinese and Central Khmer are the common languages used in Vietnam (consider regional differences). Cambodia, China and Laos are bordering countries. 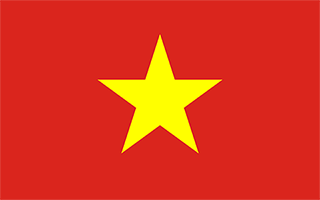 Vietnam officially the Socialist Republic of Vietnam is a country in Southeast Asia. Motorbike adventure tours: there are many tour operators who provide motorbike tours around the remote regions of Vietnam. Given that motorbikes are the main mode of transport in Vietnam, this can be a particularly authentic means of traveling through the country and visiting those off-the-beaten-track places. Most tours include accommodation, petrol, helmets, drivers and entry tickets to local places of interest. They usually speak good English or French and offer customised tours if desired. The landscape is low, flat delta in south and north with central highlands as well as hilly, mountainous in far north and northwest. The average density of population is about 290 per km². The climate in Vietnam can be described as tropical in south with monsoonal in north with hot, rainy season (May to September) and warm, dry season (October to March). Potential threats by nature are occasional typhoons (May to January) with extensive flooding, especially in the Mekong River delta. To reach someone Vietnam dial +84 prior to a number. The local cellular networks are operated on 900 MHz, 1800 MHz, 3G, 4G. Websites typically end with the top level domain ".vn". If you want to bring electric appliances (e.g. battery chaarger), keep in min the local 220 V - 50 Hz (plugs: A, B, C). The sign for the locally used currency Dong is VND.